In order not to worry about transporting your bike, we offer you the possibility to rent excellent mountain bike models. Rental price is per day, and if you are interesting in renting for a longer period, please contact us. 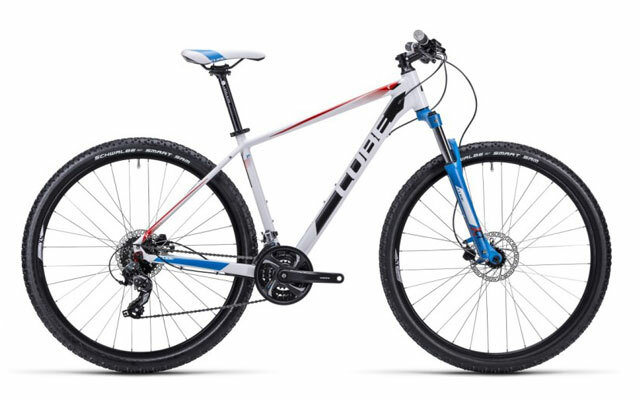 In our offer we have CUBE AIM 29 PRO bikes avaible in three sizes: 17, 19 and 21 inch. A reliable hardtail with a comfortable seating position and efficient 24-speed transmission. The sturdy frame is built of Aluminium Lite 6061 and is designed with RFR geometry to deliver a comfortable riding position thanks to a shorter top tube. The cross-ovalized down tube is manufactured using Cube’s Advanced Mechanical forming process, designed for high durability. The bike also includes clean cable routing, Scape Aluminium stem and handlebar, and Shimano 3×8 components with Acera rear derailleur. The Suntour XCT fork comes with 100mm of travel. Comfort comes from the Schwalbe Black Jack tyres and the Scape Active 8 saddle, which is perfect for longer rides. Feel free to send us inquiry, if possible we reserve a bike for You!